I’m delighted to welcome Kaisha also known as The Writing Garnet to the blog today. I must just mention that I love the phone case you can see in her photo! -waves- Hiya everyone! Thank you for having me on your blog! I’m Kaisha aka TWG (The Writing Garnet), i’m a single mumma to a beautiful little girl! We live in sunny Scotland, but my accent gives it away that I’m not originally from here :D.
HUGE HUGE fan of Jaqueline Wilson books, still am. I used to read the Babysitters Club by Ann.M.Martin, The Magic Faraway Tree by Enid Blyton, The Little Vampire by Angela Sommer-Bodenburg..just to name a few! I was a massive bookworm as a child, and I still am. Honestly? To be associated with authors and the publishing world has been a dream of mine for over ten years. I have never really had the confidence to do anything about it. But, my life took a turn and I became even more ill and I found myself relying more and more on books as an escape. That’s when I decided to put my skills to use and start my blog. Oh my, so many things! I love being able to write my own views on things without getting told I’m too blunt haha, showcasing my voice with my biggest passion, books. I feel incredibly honoured to be able to read such wonderful books and be able to talk to very talented authors as they come onto my blog. It’s amazing. So surreal. My blog is called The Writing Garnet, also known as TWG for short. I only started my blog back in March (2016) so it is still a baby! Not only do I review books on there, I also interview wonderful authors and have some of them write guest posts for me. Plus, I have my own little features which may include something book-ish, but I might be just voicing my opinion in a humourous way. TWG isn’t a one genre type blog either. A lot of people associate me with just chic lit, but, whilst I do thoroughly enjoy that genre, I also review psychological thrillers, Women’s fiction, YA, children’s books, pretty much anything except sci-fi type. I find the variety of genres appeals to a lot of readers. Sorry, I’m rambling now! Ahhhh, thats like choosing a favourite biscuit! Impossible!! Let’s see….Melody Bittersweet and the Girls Ghostbusting Agency by Kitty French is hilarious. Sam Carrington’s – Saving Sophie was paper bag worthy…ie…you needed one! Brilliant. Ahhh this is hard! Sorry I’m giving you more than three now. Sue Watson’s – We’ll Always Have Paris. LOVE. Karen Burns – The Paris Effect. Claire Seeber – The Stepmother. Lily Graham’s books. I’ll stop now haha. Both paperback and Kindle. I never read in the bath, I’m too accident prone for that! I always read at night time, and when I’m settling my little girl. I’ll try and sneak in more reading during the day if possible. Multiple ways actually! My blog address is: https://thewritinggarnet.wordpress.com – people can follow it by e-mail too via the button. You can follow me on twitter @kaishajayneh, Instagram @thewritinggarnet. Also, my blog has its own facebook page www.facebook.com/thewritinggarnet. I can easily be found on facebook myself if you can’t get hold of me, not many ways eh 😉 http://www.facebook.com/kaishie. Good question! Silky from The Magic Faraway Tree because even though she is small, she sprinkles magic wherever she goes and always knows how to get out of tricky situations! 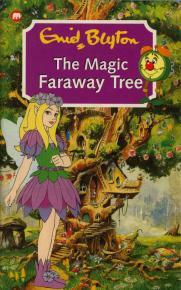 I used to LOVE The Magic Faraway Tree when I was a child.